When U.S. Army veteran Luis Carlos Montalván returned from war in Iraq, he attempted to fight physical injuries and Post-Traumatic Stress Disorder (P.T.S.D.) with alcohol. Now, Montalvan sees himself as part of a buddy team, one that negotiates a thousand potential obstacles and conflicts every time they move out the door. 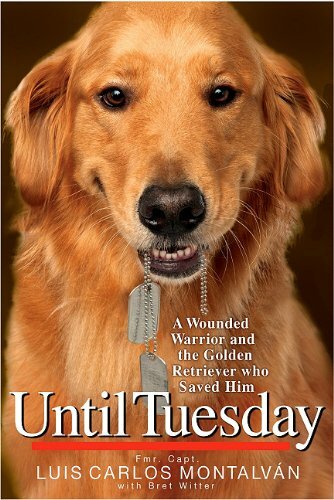 His buddy's name is Tuesday, a golden retriever who wears a uniform. Tuesday is a psychiatric service animal. Montalván's book, co-authored with Brit Witter , goes on to present a conversationally paced primer on service animals, PTSD, and how people don't always make it easy for soldiers to come home from war. Lu Picard [another trainer] told me later we were together for five minutes, although I could have sworn it was thirty seconds at the most. "What was that about?" she asked, as Tuesday and I walked past, side by side. Lessons are easy to sniff out along the way, such as "The leash goes both ways" and "PTSD is dwelling disease." The book's pace is easy, the tone conversational. Mostly, it's like walking the dog. There more than a few playful romps, but there are also occasinal tense moments and tight spots, everything from an Iraqi-border showdown to a first-date frustrated by a dog-blocking bus driver. Montalván and Tuesday are now ambassadors of a sort, out to win hearts and minds, and to open doors for others like them. Luis Carlos Montalván will speak to a Central Iowa audience Sunday, Feb. 12 about the ways his service dog has influenced his life, with a book signing to follow. Roosevelt High School, 4419 Center St., Des Moines, Iowa, 2 to 4 p.m. Tickets are $20, and are available at Canine Craze and Beaverdale Books, via Paws & Effect, or at the door. This event is a fundraiser for Paws & Effect, a Des Moines-based non-profit that trains and places service animals with combat veterans and others. It can cost more than $20,000 to purchase, train, outfit, and maintain a psychiatric service animal. Readers of the Red Bull Rising blog may remember that the organization named one litter of future service dogs has been named in honor of the 34th Infantry "Red Bull" Division. For more information regarding the Feb. 12 event, contact Paws & Effect Executive Director Nicole Shumate at: nicoleshumate@paws-effect.org; 515.822.5285. O Charlie Sherpa, you got me crying in my breakfast tea, which is a good thing. Luis' story about "taking a knee" with Tuesday, touched me deeply. This action revealed Luis' own wisdom and deeply compassion. This is a very human and living creature story. God bless Luis, Tuesday, and you Charlie Sherpa. Thanks so much for your blog and story telling. Peace be with you. @ Christina Fawn: I've been learning a LOT about service animals recently, and agree that Tuesday's mission sounds awfully attractive! Paws & Effect, the non-profit mentioned in this post, also needs volunteers to raise puppies before they're fully trained and placed with veterans. If only my house and family were in a position to volunteer right now! In the state of Iowa, a service-animal-in-training is afforded the same access rights as a service animal, which means that "puppy raisers" are encouraged to take their dogs out in public: concerts, restaurants, work, etc. Helps with socialization, acclimatizes the dogs to noise, chaos, the randomness of life. Plus, it's a great, friendly, hands-on way to tell the PTSD/homecoming stories. The dogs have already opened a lot of doors (and minds) here in the Middle West. But it's going to be a long road. I'll keep you posted. @ Debbie of Boise: Thanks for your kind words! I'm glad that the excerpts I selected resonated with you. In truth, the book was hard to distill down to a "short" blog-post. Lots of nice moments and insights in there. Bonus news: There's talk of an "Until Tuesday" movie out on the Internet. How great would that be? !